A little over a week ago, Charley’s (our 10 year old Shepherd mix canine) MRI showed a pinched nerve in his lower back where he has a bulging disc. The recommendation by the surgeons is to do surgery to relieve the pressure and compression on the nerves. The scary part is if we do nothing, it can lead to paralysis of his hind legs and other not so fun stuff. We know that rest and meds won’t work because he’s been on so many meds for months now for other pain problems associated with hip dysplasia. The operation to fix his bulging disc is scheduled for tomorrow and since I have not been thinking about it too much, I haven’t been too worried. But it’s TOMORROW MORNING…it’s getting closer and I’m getting more and more nervous. We’re anxious to know if this is the right decision (who doesn’t second guess themselves?) and at the same time are ready for him to be done with it and get to rehab and to healing. Please cross your fingers for us. I’m going to be a big ball of tense tomorrow. 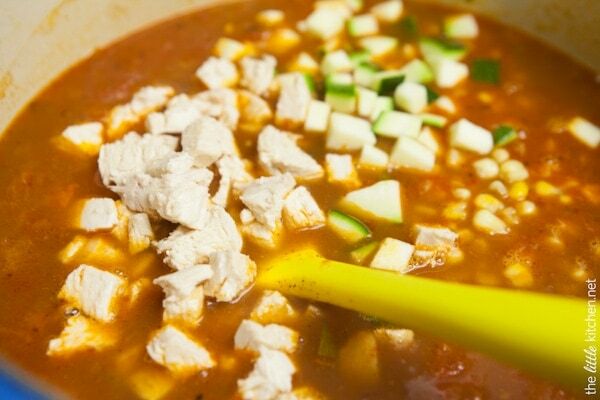 In comes this soup, I’m going to be making another pot of this chicken tortilla soup this week. It’s a big pot of comfort. I love soup because it’s warm and comforting. I made this the week of my birthday and had it for leftovers for 4 or 5 days afterwards. It’s really nice and easy and I love the addition of zucchini. I add the zucchini at the end so it doesn’t overcook. 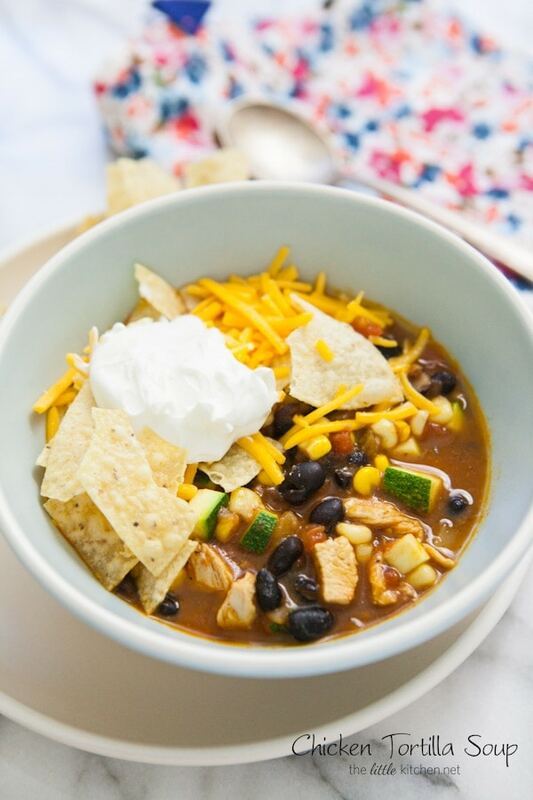 Top this soup with tortilla chips, sour cream and sharp cheddar…all a must! Then chop the canned tomatoes. 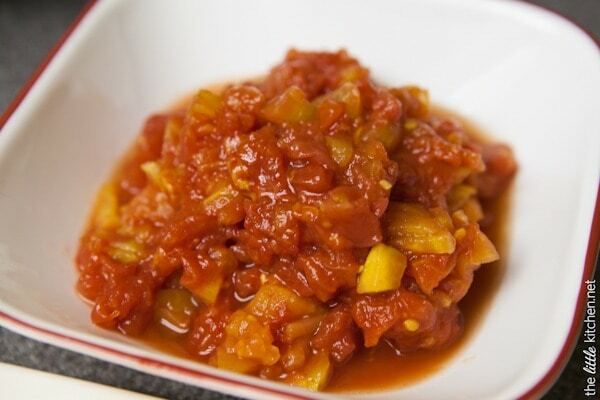 I love canned whole plum tomatoes so I use a 28 ounce can of those and chop up the tomatoes. Don’t get rid of the tomato juice. That will add flavor to the soup! Butter…everything with butter is better, right? 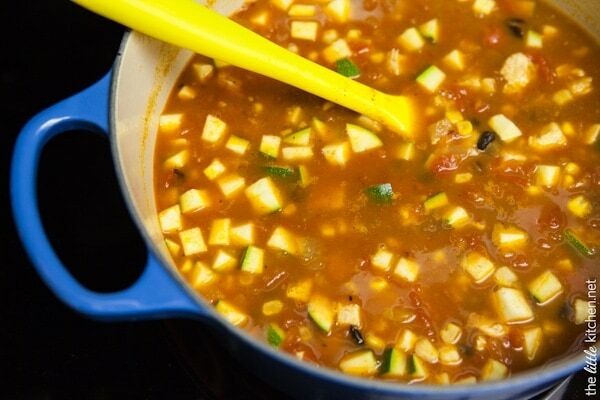 I use butter and olive oil to start with in this soup and add the vegetables (but not the zucchini) and garlic along with my homemade taco seasoning all into my French oven. 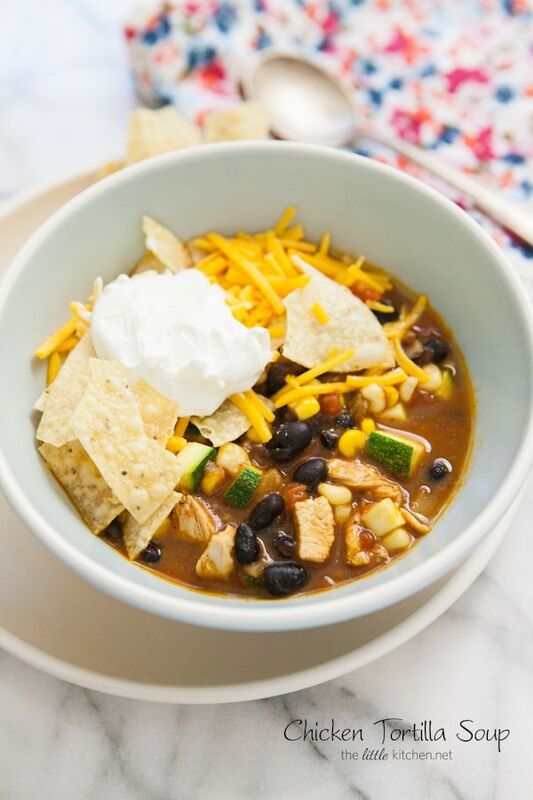 I have used other chicken tortilla soup recipes that are quick and easy but they didn’t have the depth of flavor I was looking for. This one does…the taco seasoning has so many levels of flavor from the paprika to the chili powder and cumin that adds so much flavor along with the chicken and the vegetables. This is after I add the drained and rinsed black beans, tomatoes and chicken broth. After you bring it to a boil and allow to simmer, add the cooked chicken and zucchini and cook for another 5 minutes. It’s done and ready to serve. The toppings are a must. And the next time I make this soup, I’m going to freeze some so if the craving hits me…even if it’s in the middle of hot hot Florida summer, I can have a bowl. Make this…you’ll thank me for it! Soup under 40 minutes, yay! 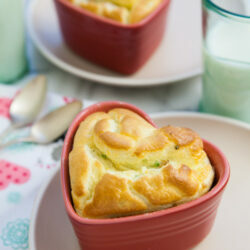 Check out the video I made for this recipe too! 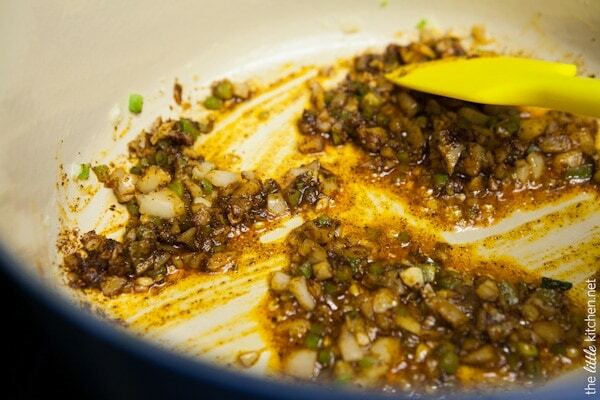 In a French oven or a large heavy bottom pot, melt butter and heat olive oil on medium heat for about 2 minutes. Add taco seasoning, jalapeño, onion and garlic. Sauté for about 3 minutes. Add tomatoes, black beans and chicken broth and bring to a boil. Reduce heat and allow soup to simmer for 10 minutes. Add zucchini, corn and chicken and heat for about 5 minutes. Season with salt and pepper, if necessary. Serve in bowls topped with crushed tortilla chips, cheddar cheese and sour cream. 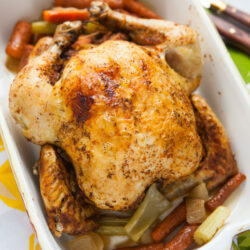 You can use leftover cooked chicken or if you don’t have any. Bring a pot of water to a boil and add a boneless skinless chicken breast. Boil for 5 to 7 minutes. 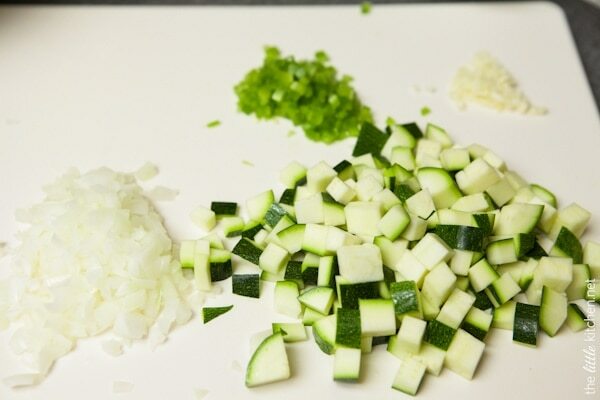 Remove from pot and place on a clean cutting board. Cut into cubes. Pinned! Must make this as I have some of that taco seasoning and a zucchini! Prayers for a successful surgery. Prayers for a good surgery for your puppy! Poor pup! Praying for a successful surgery (and for your nerves :(). This soup looks like the perfect bowl of comfort. Sending good thoughts for your pup (I know he’s 10…but still your baby.) This is my favorite type of soup, very comforting too. I am so sorry that you have to go through this, Julie… Sending prayers that everything goes well! This soup is a pure comfort in a bowl! Love it! I hope Charley comes through it all a miracle pooch. My poor old girl is in her twilight years, so I’m just trying to keep her happy. Praying for a good surgery. Hang in there!! Great soup choice and high five paw to Charley! 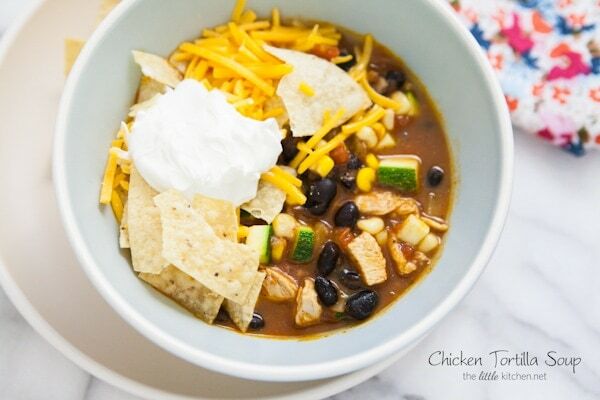 I love chicken tortilla soup, this looks so good! Hope Charley is healing well! ohhh this soup looks so comforting. I’m so glad Charlie’s surgery went well… hugs to you friend! In due time, Charley will recover, and it will be so nice when you can see his jovial self come back. Relieving his pain will bring you all so much relief. Not the bank account, sadly, but it won’t be long before Charley will be able to reward you with those bright eyes and toothy grins. Good luck, Charley! Woof! I just love chicken tortilla soup 🙂 saving this recipe!! Hope your baby is okay! I completely understand, my 12 year-old boxer (Chance) had a rough week also. They’re like family. 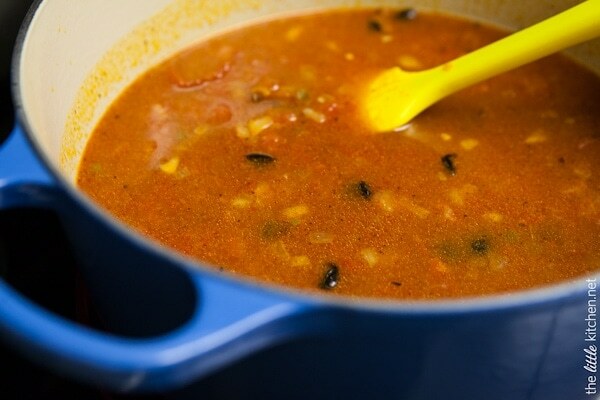 Nothing comforts like a big bowl of soup… love your recipe and can’t wait to try it! This looks SO MUCH BETTER than the recipe I made last week. It was so plain, had hardly anything in it. I’m going to try this one! Hope you like it, Valerie! I made your soup last night and it was a big hit. I pretty much followed the recipe (hard to do with soup because I have a tendency to start throwing in anything at hand) except I added a couple of fresh tomatoes and 3 tablespoons of the spice mixture because that made it even yummier. Thanks, this one will go into the regular rotation because it is a great use for Costco rotisserie chicken pieces, a working mom’s best friend. 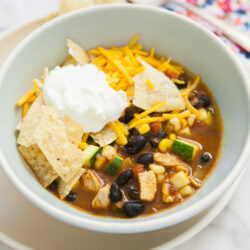 Pingback: Healthy Chicken Tortilla Soup Recipe | Mexican Appetizers and More!